Everyone knows Bobby Knight is from Orrville, but getting the chance to see him up close and personal was a treat that I and nearly 1,000 others got to enjoy back in September. He spoke for 90 minutes, and stayed for another 2 hours to sign autographs and meet each and every person in attendance. Best of all, it was all for the benefit of the Orrville Boys & Girls Club, which took in nearly $25,000 on the evening. It ranks #3 because it will probably never happen again, so there's no overstating the fact that a "Night with Knight" was a once in a lifetime experience. Plus he signed a nice little memento for me. This was a piece of the old bleachers that was finished & painted by the Industrial Tech class. Thought it was cool to have the guy who paid for the new bleachers to sign a piece of the old bleachers, in the gym that he played in, that now bears his name. This game and the week(s) leading up to it was just an awesome spectacle. Not sure anything other than another state title will top this game in terms of memories. 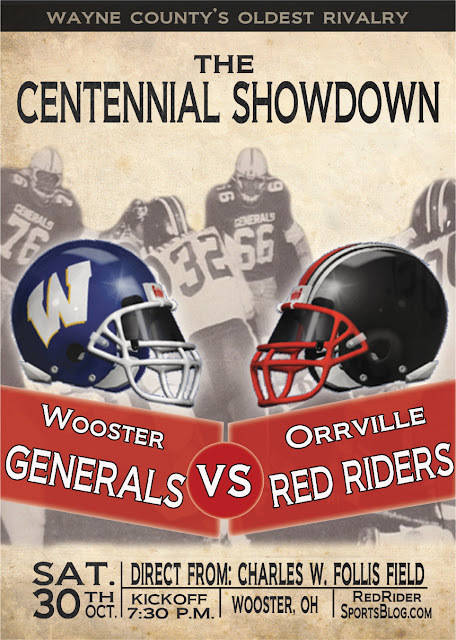 A Wooster-Orrville game is always special, but this year was much different. From the opening parade of players, to the teams running through decades of Red Riders, to the pregame fireworks, to the in-game fireworks courtesy of a determined bunch of Red Rider football players and a 6th straight win over the Generals, it was just an awesome evening from start to finish. By the time I finished talking to Coach Davault for OrrViews, I was the last person to walk off Follis Field...and to me, there's nothing like an empty football stadium with the lights still on. As I purposely crossed the exact middle of the field, the sounds of the game still echoed and I thought about all the players who took part in this rivalry over 100 games and 100+ years. The thrilling wins, the crushing defeats and everything in between. It's just 48 minutes of football, but inside of that time, legacies are born, community pride is strengthened, and a great rivalry is continued. It was pretty cool and something I'll never forget. Also very humbling was the fact that my brother-in-law & I designed the commemorative program cover. Just a few months later, it has taken on so much more significance to me. Never did I think that something I dreamed up would end up as the program cover. Nine down........and just one to go, and if you can't guess what gets the top spot by now, then you're not an Orrville fan. Check back tomorrow to read about it all over again.